The Natural Reflections 5/16 in. product collection is an eco-friendly alternative to traditional 3/4 in.solid hardwood floors and is proudly made by Bruce (Beverly, West Virginia). Made in a thinner 5/16 in. structure, these floors use approximately 50% less raw material than traditional 3/4 in.solid products giving you the same beautiful, solid hardwood visual and performance with some truly unique advantages compared to 3/4 in.thick options. Unlike most factory-finished hardwood floors which have a bevel along the upper edges and ends of the floor, the Natural Reflections 5/16 in. thick solid product from Bruce features a Square-edge, Square-end profile. Unique in the industry from Bruce, this gives you much more of a traditional sand-and-finish or “site-finished” visual with all of the advantages of a heavy-duty, factory-applied finish. And, because these floors come in the low-profile 5/16 in. thick format, they can be installed using either a staple-down or glue-down method and don’t dramatically increase the height of your finished floors. In addition, unlike most traditional 3/4 in.solid floors, they can be glued-down directly to concrete subfloors (see Installation Instructions for full details). 40 sq. ft. per case and case weight: 46 lb. 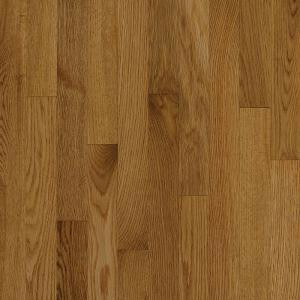 Buy online Bruce Natural Reflections Oak Spice 5/16 in. Thick x 2-1/4 in. Wide x Random Length Solid Hardwood Flooring (40 sq. ft. /case) C5012, leave review and share Your friends.